There are several species of kangaroos that vary in size and color. Like deer, males are called bucks and females are called does. Babies are called joeys. The kangaroo has been around for a long time and millions of them exist today. 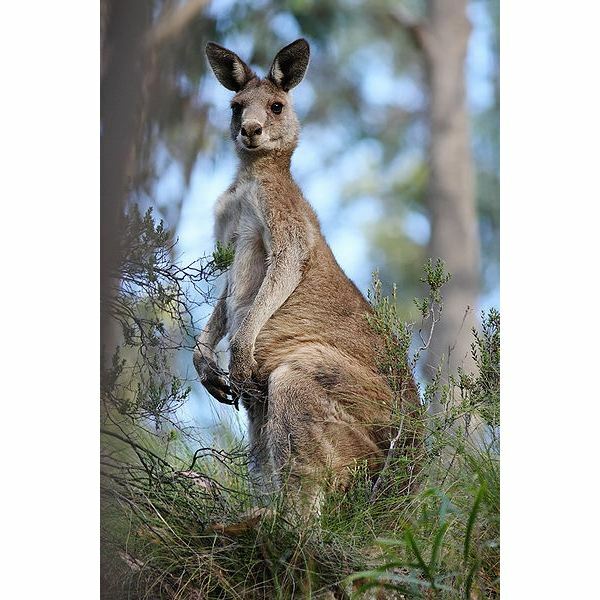 Below is interesting information and fun facts on kangaroos to help you better understand these fascinating animals. Kangaroos have coarse, thick, wooly hair that can be red, grey, or brown in color. The red kangaroo is the largest of the species that can reach a height of 6 feet and weigh up to 200 pounds. Most kangaroos weigh between 50-120 pounds and the females are generally smaller than the males. 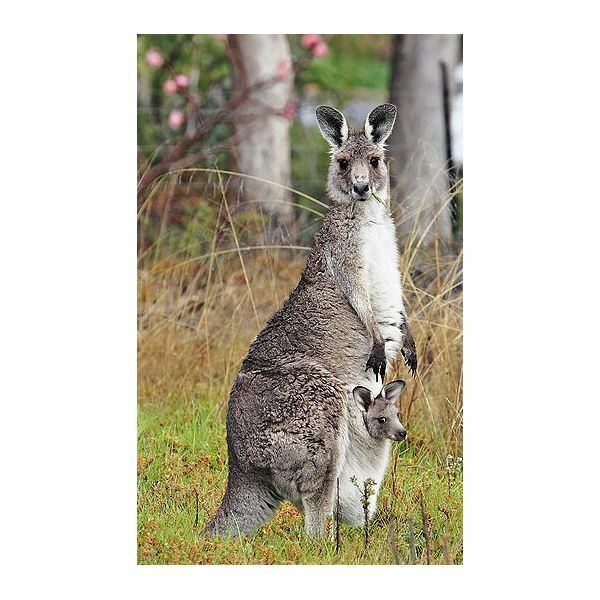 Kangaroos are marsupials, meaning the females carry their newborn babies in a pouch (other marsupials include the opossum, sugar glider, and koala). They have powerful hind legs with large feet and strong toes, short fore limbs with no thumbs, and long tails that balance their bodies. Kangaroos live in Australia, Tasmania, and surrounding islands. They live in varied habitats, including forests, grassy plains, woodland areas, and savannas. Kangaroos are social animals. They live and travel in "mobs" (groups of about 10) which are dominated by the largest male. They are nocturnal, meaning they are most active at night (particularly during the twilight and early morning hours). 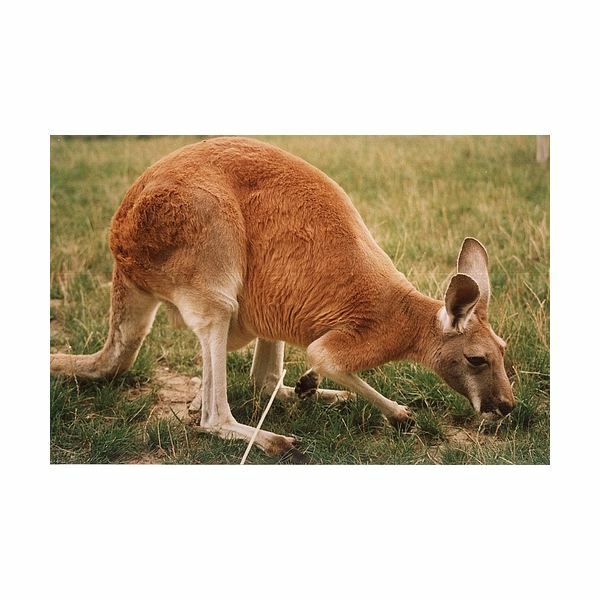 Kangaroos are the only large animals that get around by hopping. They can not move backwards and they can not move their hind limbs independently (one at a time) on land. However, they can kick one foot at a time when swimming. Because of their powerful hind legs, kangaroos are able to travel at speeds of about 30 miles per hour, jump as high as 10 feet in the air, and leap about 30 feet in length. Male kangaroos not only box to fight off predators, they also box to play and to compete over females. Using their fore limbs to box is pretty harmless but using their hind legs (with long, sharp claws) to box can be quite dangerous. They have been known to disembowel opponents. Kangaroos are herbivores, meaning they eat only plant material. Mostly, their diet consists of grasses. Like camels, kangaroos need very little water to survive. Normally, female kangaroos have one joey at a time. The gestation period lasts 31-36 days. At birth, the tiny, pink, hairless joeys (weighing about 0.03 ounces) crawl into their mother's pouch to nurse and grow. Usually they will leave the pouch for good in 8-12 months. Females can have three babies at one time: an embryo awaiting birth, a young one in the pouch at all times, and an older joey outside of the pouch who still nurses. Because of this, the mother is able to produce two different kinds of milk to meet their needs. One teat has milk high in fat for the younger joey and the other teat has milk high in carbohydrates for the older joey. • They have very good eyesight but can only respond to moving objects. • Kangaroos have excellent hearing. They have large ears which they can swivel in every direction to pick up sounds. • On average, kangaroos in the wild can live 6-8 years. In captivity, they can live up to 20 years. Eastern grey kangaroo pictures courtesy of www.flagstaffotos.com.au. 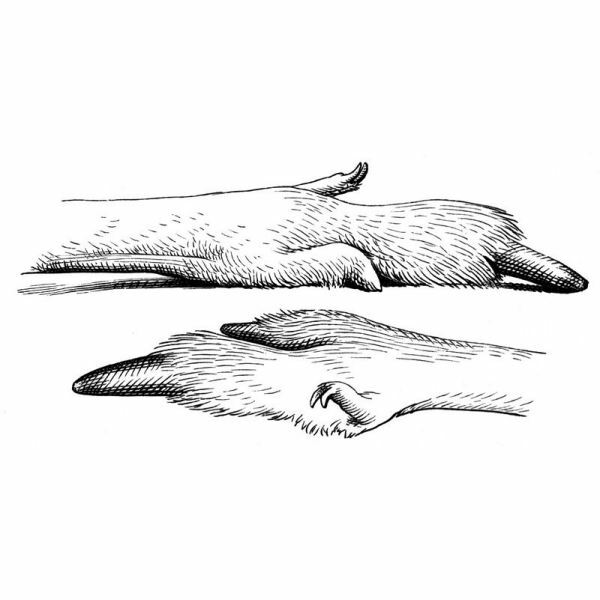 Red kangaroo and kangaroo hind leg images in the public domain.